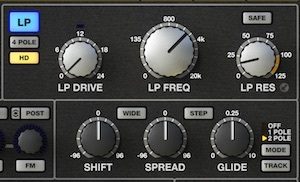 New filter: WSP - based on the EDP Wasp synth filter with unique CMOS inverters. New filter: AMU - based on a custom design inspired by the ARP Odyssey mk1 filter. New filter: KSM - a custom design input mixing Sallen Key. Resonance boost "trimpot" for extreme resonance up to 200%.